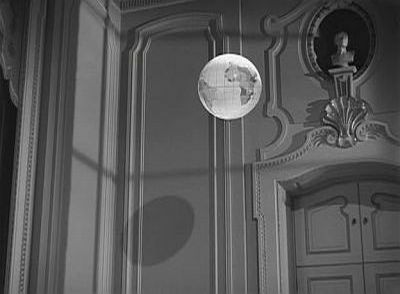 There is a wonderful scene in Modern Times that I had forgotten. Charlie Chaplin and Paulette Godard are sitting on a lawn outside the house of a suburban middle class family. The husband leaves for work, and is farewelled by his loving, apron-clad wife. Charlie turns to Paulette: Can you imagine us in a little home like that? And they proceed to fantasise in unison. They are now inside the house. He, the industrious husband, plucks an orange from a tree branch that reaches through the open window, then proceeds to wipe his hands on the curtains. She, the proud housewife, is cooking a roast. They need milk, so Charlie hails a cow through the back door of the house and motions it to express some in a jug that he has placed on the doorstep. While he waits, patting the cow affectionately on the back, he plucks grapes from a vine. Then they sit to have dinner, and the film cuts back to the lawn and a famished Godard, for imagination stops short of filling the stomach. For good measure a policeman intervenes, shooing them off the lawn. The point of the vignette is to show that the two characters are so poor they cannot fathom what bourgeois life actually looks like. They don’t know how food gets on the table of the affluent, so they speculate that it must be nature bowing to their needs, as if they possessed a secret code or language from which the street and the factory had alienated the poor. What rekindled this is that lately in the family we’ve taken to watching old films over the weekends. I figured our eldest, who’s ten years old and into history, might take something of an antiquarian interest in them, but I didn’t anticipate how much he would enjoy them, nor that our youngest, who’s four and primarily into cars and running headfirst into people and furniture, would also find them absorbing. The day after we watched Modern Times he – the youngest – asked to see it again, and later, when we moved on to the Marx Brothers, he took an instant liking to Harpo. Much as I’m tempted to take pride in the progeny (budding cinephiles, in this very home! 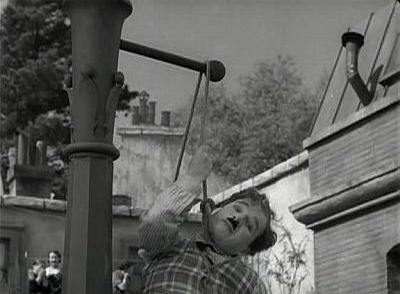 ), the more useful hypothesis is that there is something that connects the particular films we chose – Buster Keaton, Charlie Chaplin, the Marx Brothers – with the ones on which our children have formed their taste and their understanding of how cinema works; something that connects silent comedies with contemporary cartoon slapstick, as well as roughly comparable modes of storytelling, and that this is enough to make up for what is more outdated and less likely to appeal – including the vast differences of social and political milieu, or historical context. For instance: it may be difficult to imagine Modern Times’ ‘little home’ dream sequence in a contemporary mainstream comedy pitched at adults, but arguably less so in a Pixar film. That particular style of manipulating expectations and dealing in absurdity hasn’t disappeared altogether, and we are reminded of its lineage. Watching old films, at almost any age, is a way of recovering a history of seeing. I don’t know if the audience at that early Lumiere screening really did run away screaming as the train pulled into the station or if the story is apocryphal, but I do know this: that when I saw Ghostbusters, in 1984, the digital monsters that now look to me like they were drawn with felt pens directly onto the stock seemed utterly believable and photorealistic. I was wowed back then, yet I cannot recapture that feeling or restore that belief now. As the representational benchmark of what counts as realism shifts, it seems that the mind – mine at least – updates its expectations. 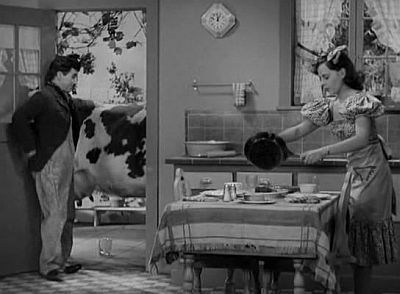 Modern Times (1936) – a silent film released nearly a decade after the first talkie – must have seemed incongruous to its contemporary audiences, underscoring the point that these histories are seldom linear. 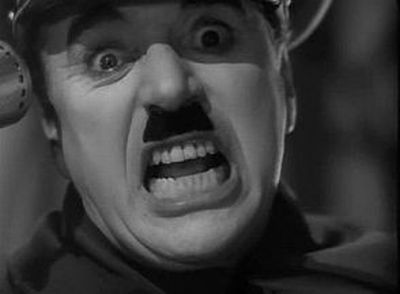 However The Great Dictator (1940), of the ones the family has seen so far, is the film that signals the greatest departure from expectation and norm. That Chaplin reinvented his Little Tramp as a German Jewish barber would have been enough of a challenge to his public, but the balancing of comedy and drama is so much more subtle, so much more daring than anything I’ve seen since. 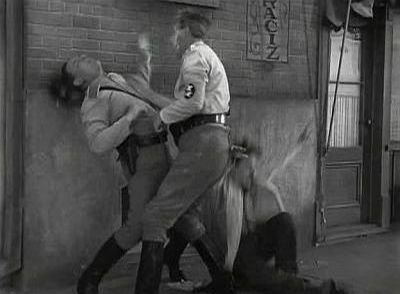 The scuffles between Chaplin and the German police in the ghetto are played on a knife’s edge, always seemingly about to tip into the comedic. Then suddenly, he’s about to be summarily hanged. 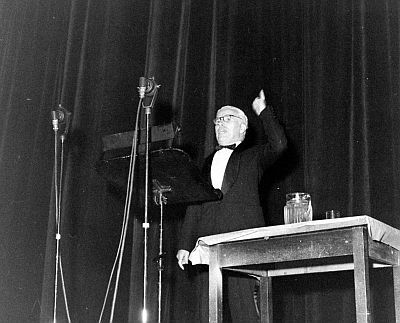 The film’s final sequences, and the barber’s impromptu speech to a crowd that thinks he is Hitler, point to a different conception of the social and political value of cinema altogether; an attempt to intervene directly into history, perhaps. 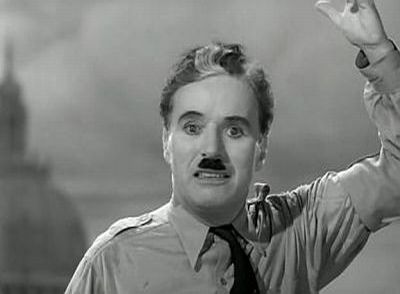 This is Chaplin as Hynkel/Hitler. This is the barber speaking to the crowd. And this is Chaplin two years later, in 1942, urging Americans to donate to the Russian War Relief fund, a spilling over of his role in The Great Dictator that would make him a subject of investigation for un-American activities after the war. 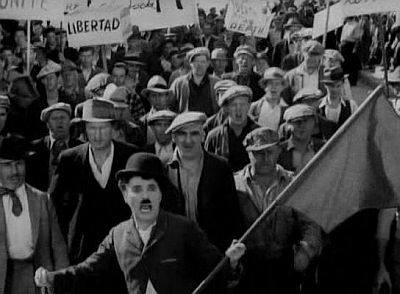 Another image from his films springs to mind in this regard: it’s from Modern Times, when the Little Tramp – storming down the road after losing his job – accidentally joins a communist demonstration, of which he remains unaware until the police arrives to break it up and he is arrested for sedition. I always enjoy going back to Keaton the most. There is something about his invention that to me is the definition of pure cinema. 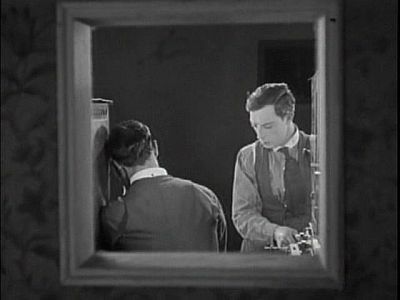 Something as simple as the cannon scene in The General (1926), or as contrived and elaborate as the gag in Sherlock Jr (1924) where he jumps through a window and comes out the other side wearing a woman’s dress – that he did this without trickery, and yet was fully prepared to be the trickster, to use the medium to its fullest capacity to deceive. Sherlock Jr did that thing that nobody since, least of all Woody Allen or Martin Scorsese, has quite been able to replicate with as much grace: the doubling of the film upon itself, creating two levels of reality for the lead character to inhabit. It is and will likely remain unsurpassed, if only because he did it first. That too is a part of a history of seeing: the sense that cinema back then might have been open to different possibilities, to alternative futures that didn’t play out. It certainly pays not to harbour too many romantic notions about how the industry operated in the twenties or thirties: it was every bit as ruthless, every bit as profit-driven, as the careers of the artists we’re revisiting on our Saturdays and Sundays illustrate. But I still get the feeling when I watch that some of those problems, not just of how to set the scene but also of how to surprise and entertain, were being faced for the first time, and that this came through into the final product as a quality that cannot quite be replicated. I very much hesitate to call it innocence. Sometimes it was just bad cinema. 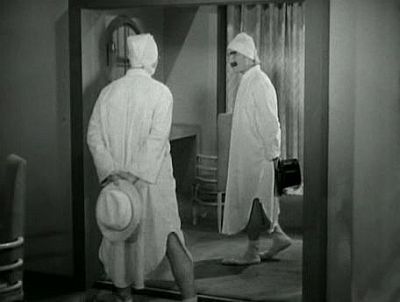 We could sit in front of the mirror sequence in the Marx Brothers' Duck Soup (1933) and successfully argue that it is poorly constructed, and that no modern viewer would buy its premise; that it is unaccountably static, a gag transposed as opposed to adapted from the stage. But it’s just so bloody funny, and whilst being so funny, almost casually, it tells you the story of a man who (rightly) distrusts his reflection. You try putting that into clever words, or a better scene. In my whole life I have spent a total of seven days in the United States, in 2006, to attend – of all things – a criminology conference. I had to organise my own accommodation and so I spent some time on the internet checking out customer reviews of hotels in downtown Los Angeles. This was a mistake. As most people know but I didn’t back then, these reviews are seldom if ever written by people who have had an ordinary experience and/or are in full control of their nerves. Horror stories abound, if not about the establishments themselves, certainly about the neighbourhoods, which in big cities are nearly always depicted as being critically unsafe. I quickly formed a mental picture of a place in which I would be mugged or gunned down if I so much as dared to venture outside my hotel after dark. The mass shooting in Aurora last Friday is finely balanced on the boundary between the Real and the spectacle of the Real, its representation for the purposes of entertainment. 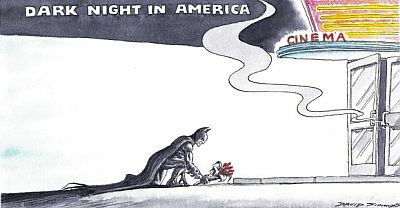 That the event is already routinely referred to by news media, with ghastly laziness, as ‘Batman shooting’ shows that the choice to ride that boundary can’t be imputed to James Holmes alone. When we say ‘tragedy’ we mean the horrible thing that just happened, and tend to overlook the fact that the word originally belonged to the theatre, but now the tangle is well and truly inextricable. A man acquires a small arsenal and assaults a cinema full of strangers, styling himself as the villain of the film that is being projected onto the screen. As a response and a mark of respect, the producers of the film choose to temporarily withhold information about how much money the film has made during its opening weekend, thus of how successful the spectacle was. The next day the National Rifle Association – the body that lobbies on behalf of men who wish to acquire small arsenals, and that for many years used to be chaired by a film actor – greets its followers with the words “Good morning, shooters”. This is all theatre. Last Friday it just happens to have had real victims. It is part of the theatre, too, to hear calls against people who politicise, or can be accused of politicising, the tragedy. These have the predictability of a recorded voice blaring out of a PA. The victims of the attack would have been okay if only they had been allowed to carry concealed weapons of their own, says Tammy Bruce in the Guardian online. The answer is more guns. Charlton Heston always went on the offensive too, as he did after Columbine. He knew that it’s what works. However that response begs the question of what it means to politicise an event like the attack on the theatre audience in Aurora. This, in the language of the NRA, simply means: liberals reflexively calling for stricter controls on gun ownership. It is in the interest of gun lobby to reduce the politics of gun violence to a question of market regulation, of supply and demand. Look at Utoya, says Bruce: didn’t Anders Breivik get hold of all the weapons he needed in spite of Norway’s strict gun laws? Couldn’t those kids have defended themselves against him, had they been armed? That a commentator can suggest, and in The Guardian of all places, that militarising children at a summer camp is the solution to mass gun violence while the President calls timidly, inanely for ‘common sense gun control’ shows to what extent the Right owns this debate. The other cornerstone of the conservative argument is this: that madness and evil belong outside of society, therefore implicitly outside of politics. The depoliticisation of the Utoya massacre, the attempts to characterise Anders Breivik as a madman whose stated motivations couldn’t be taken seriously or at face value, much less be linked back to the people and the groups that he acknowledge to have been inspired by, might seem uniquely egregious, but how can gun violence on this scale be depoliticised at all? How is the society that isolates, the society that overlooks, the society that arms exonerate itself from all political responsibility, as it did after Columbine and is in the process of doing after Aurora? Acts of madness are like acts of God, outside of our control, claim these voices. Nor was there a chance, in the country that grants its authorities extraordinary powers of surveillance, to detect and raise alarm over the online purchase over two months of over 6,000 rounds of ammunition, in part perhaps because such purchases are not only legal but also not necessarily unusual. At any rate, says the FBI, the only defence against Lone Gunmen is other citizens reporting their suspicious behaviour. There is no technological solution, no mechanized system of control nor sweeping power of enforcement that could protect society against such a threat. 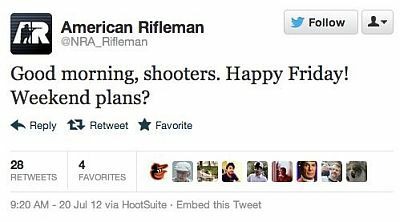 This tweet posted the morning after the shooting by the account of the official journal of the National Rifle Association was met with understandable outrage, to which the organization responded first by deleting the tweet, secondly by deleting the account, and thirdly by claiming that the person who posted the tweet was unaware of the Aurora shooting at the time. I see no particular reason to disbelieve this claim. What I find chilling is that on any other Friday morning this would be the greeting directed to the account’s 16,000 followers, and nobody would think of taking exception. What does it mean to call yourself a ‘shooter’, as opposed to a gun owner, or even a gun lover, if not that what you do, what defines you, is that you put your gun to use? There is a distinct shift in rhetoric here: it is no longer the gun as an instrument of defence, not only of oneself but also of the country and its way of life – which how the NRA has historical framed the issue and leveraged its interpretation of the second amendment of the U.S. Constitution – but the gun as instrument, as tool, and not just nor primarily for sport. Behind, a massive industry that needs to not only sell the weapons but ammo as well. In fact Wal-Mart will only sell you the latter (although it’s bringing back the guns now too). And so the customers of this industry become shooters, and the act of purchasing 6,000 rounds of live ammunition is redefined as model consumer behaviour and no longer constitutes its own kind of madness. Finally there is Batman. 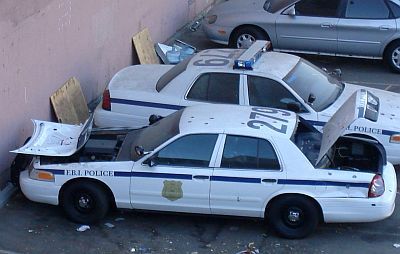 The one between film violence and real-world violence is the most problematic of correlations, and what happens to a culture, to a society when the scene of the spectacle becomes literally the scene of the violence is equally hard to speculate upon. If it is in fact true, as the police has claimed, that the attack was the culmination of months of careful and deliberate planning, this would neatly match the meticulously orchestrated marketing campaign for The Dark Knight Rises, adding another set of elusive correspondences. As Elliott Prasse-Freeman and Sayres Rudy argue in their analysis of the trailers for the new Batman, in contemporary cinema this film-before-the-film has become just as rich a text as the feature itself, and equally important – if not more so – to its fortunes. Blockbusters are made or broken by how their fare during opening weekend, so the decision by Warner Bros. to postpone revealing the takings of The Dark Knight Rises even by one day had a rather greater import that some might have realised. So much so that in the end they just couldn’t go through with it, and studio officials leaked the numbers to Deadline and The New York Times, expressing wonderment at how the film managed to ‘maintain much of its momentum in the wake of the killings’. There goes another industry that won’t give an inch, and there goes another consumer behaviour redefined as virtue, as resilience. If mass shootings are senseless, if they are random, incomprehensible acts of madness, then what makes sense, what is sane is for the disruption to be minimised and for normality to resume as soon as possible, along with the forgetting. When was it that the phrase ‘the personal is political’ started to mean that every personal choice is political? Carol Hanisch meant the opposite of this. She said that there were no personal solutions, only collective action for a collective solution. Yet I can’t remember when was the last time that I heard the phrase used in that way, and not instead to suggest, at best, that one should strive to behave in one’s everyday life in a manner consistent with his or her politics, and, at worst, that politics writ large is the result of the addition or multiplication of individual behaviours, as many as there are people. There are few acts that are more everyday, more personal than eating, thus few consumer activities that are more everyday and personal than shopping for groceries. And there are even fewer areas, if any, in which the idea of individual action and personal solutions is leveraged more aggressively than in the marketing of a large and growing segment of grocery products. For this post I’ve limited my examples to the Wellington food chain Commonsense Organics, but theirs is hardly a unique approach, and you’ll find much of the same language and imagery in both the health food and regular food section of most supermarkets, as well as in the relevant magazine and television ads, and not just in New Zealand. It is however in the health food store that the idea is most developed, this politics most explicit, and in limit cases the store itself becomes a model society. A utopia founded on ethical consumption. ‘Good for you, good for the earth’ sums up the core idea nicely: you ought to buy foods that are healthy, and that are produced in a way that is good for the environment. Both halves of the statement deserve to be unpacked, but ‘good for the earth’ is the parts that contains the greater promise: that by engaging in this behaviour – that is, by looking after your digestive tract – you’ll save the planet. The gastric is political. And I say political because the phrase ‘good for the earth’ and its accompanying bucolic imagery are only thinkable in a world in which the strategy has succeeded, and enough people and businesses operate in a way that is good for the earth to make the difference. The fact that we know this not to be the case at the present time, and that the prospect of not just improving but preventing a further catastrophic deterioration of the world’s environment are getting slimmer by the hour, is what makes the proposition utopian. So what kind of utopia is represented at Commonsense Organics? 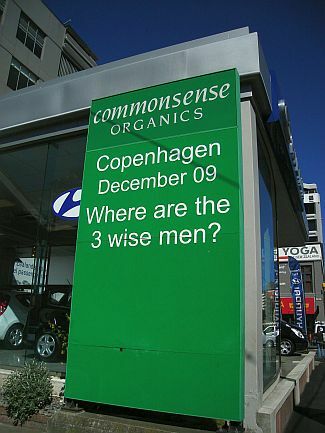 The store in Wakefield Street no longer greets the customer with slogans such as the one above, put up in the occasion of the Copenhagen Climate Change Conference, or its seasonal alternatives “Don’t fake organics this Christmas” and “Organic eggs for Easter – Battery not included”, nor the store's staple “Good Food Here”. This might reflect a laudable desire to tone down the overt smugness of the enterprise, which is a service to the critic as well: it is so easy to get distracted by the smugness, to make it the thing that shops like this are about, when they are not. Inside, the store is suitably sombre and unpretentious. On the right side as you come in it features a separate health products section – naturopathy, homeopathy, mineral and vitamin supplements – which I’m not going to get into, and I mean this quite literally as I find I can achieve similar results by throwing my wallet down a manhole. On the opposite wall, and in many respects at the opposite end of the project, is an altogether more sympathetic display consisting of a small selection of seasonal fruit and vegetables: few and not terribly attractive pieces of produce, a world apart form the cathedrals of ultra-bright and perfectly shaped items that greet you regardless of the season – tomatoes. Always with the tomatoes! – in regular supermarkets. And these are reasonably priced, too, by and large. Okay, $4.80 for a head of broccoli is pricey, but the fruit isn’t too bad. I confess also a certain attraction to organic apples, likely borne out of having to shut all the doors and windows when I stayed at my grandmother’s and the farmer next door sprayed his orchard wearing what resembled an astronaut suit, only less wieldy. In between the opposite ends of the store, between the surprisingly affordable organic apples and the 250 gram jars of surgical-grade manuka honey retailing for an eye-watering $82.50, and excluding the products that cater for specific allergies and thus fall outside of the paradigm of free consumer choice, is a range of everyday grocery products that define lifestyle on the good earth: bread, dairy, meat, biscuits, snacks, alcohol, detergents and so forth. What they have in common is, firstly, that they are ethical products, therefore either organic or fair trade or both; and, secondly, the price premium that this ethical quotient commands. Want a kilogram of Arborio rice? That will be $16. One and a half kilograms of white flour? $10.99. One kilogram of polenta will set you back $11, which personally offends me. I come from Northern Italy, where for centuries polenta was the staple of the people who couldn’t afford anything else, that is to say almost everyone outside of the cities. Hell, polenta is barely a food, really, more of a pastime. Ground corn flour has next to no nutritional content, so after you’ve spent the best part of an hour mixing it with boiling water in a large pot, and are already ten bucks in the hole, you still have to source the proteins somewhere else. 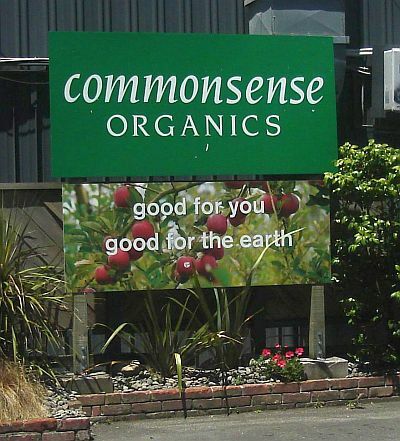 At Commonsense Organics you soon come to the realisation that in this peculiar utopia only the rich can afford to eat, which makes all those nurturing brand names – Naturally Good, Pureharvest, Bees' Blessing, Loving Earth and so forth – sound somewhat sinister. In fact the question of why should these products be so expensive goes to the heart of the entire project. Whether organic farming could ever sustain the kind of yields that are needed to feed large populations is a vexed question that we don’t actually need to get into since most of the products in the store are not just ‘oganic’ but also made in boastfully and at times extravagantly expensive ways. White organic flour doesn’t need to be stone ground, but it is. Potato crisps don’t need to be ‘hand cooked’ (whatever that means), but they are. The makers of Thoroughbread organic breads – on which more later – don’t need to grind their brown rice just before baking, but they do. All of these loving and robustly marked-up practices directly undercut the idea of sustainability and belie the notion that the good earth could – or would even want to – provide for anyone but its wealthiest inhabitants. It’s the brand names as much as the price tags that give the game away. The hand cooked crisps above, which retail for a trifling $59.80 a kilo, are called Proper. Get it? The crisps you eat aren’t real food. Is their salt even solar-harvested from the salt beds of Lake Grasmere on the Marlborough coast? Didn’t think so. Now this product is not even organic. The potatoes are regular potatoes. The sunflower oil is regular sunflower oil. So the only possible rationale for their being sold in this particular store is that they are vastly more expensive than the crisps that the people who can’t afford to shop here usually eat. The price, the brand name, the packaging, the blurb, the location are all guarantors of an experience and of a sense of moral being. A high top, soft textured loaf with a mix of added kibbled delights which are pre-soaked to slowly soften for better digestion and safe chewing. This is bread that chews itself, that digests itself for you, freeing you, perhaps, to save the earth. But the product in question has a particular name, and to this I don’t know how to respond. 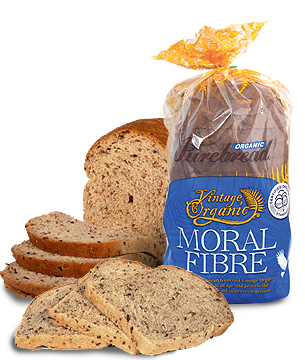 I search in vain for a justification and a trace of humanity behind the decision to call a bread Moral Fibre. This is the bread that says that I, who have purchased it, am better than you, who can’t or won’t. It is a quasi-religious signifier. A bread that elevates lifestyle to a mission, a bread that saves souls. And I don’t know how to respond to it. I am tempted to use words that are disproportionate to the evil of an artisan bread sold at a store down the road. But I am deeply worried about the things that are pure. The ancient grains. The steadfast moral purpose. Is this fascist bread, does it contain traces of eugenics? Is this the troubling, ominous endpoint of the discourse over sustainability? Or is rather the simpler, more economical explanation that premium consumers need to be made to feel good about their choices, and that these are just flattering puns? I wish I could feel disenchanted, the way you are supposed to feel, but I don’t. This earth, which is neither good nor bad, is faced with a steadily growing population, a sizable proportion of which is already starving, and a diminishing capacity to produce food. If there is a safety to be sought, it is not of a moral kind. Your children are drowning. There is no time to lose. How good is your plan? How strong is your rope? You must do everything in your power to save them. This is education in the neoliberal age: a quest not for success, but for survival. You ask what it is that will give your children ‘a better chance’. You find a dispassionately technocratic answer, based on the rigorous analysis of academic achievement data. You discount every factor that might make your children non-average, beginning with their attitudes and desires. While you’re at it, you put out of your mind the very idea of social relationships and of the social good. Remember: your children are drowning. It would be quite absurd at this time to wonder what your friends’ children, what their own friends are up to. It is a perfectly smooth, well-oiled capture mechanism: a topic that families obsess about, carefully wrapped in a foil of middle-class insecurity. 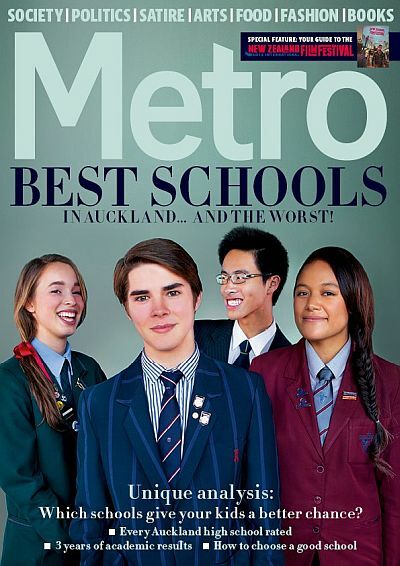 If Auckland’s Metro were a conservative magazine, it would just get on with telling you what the best schools are – that is to say, the most exclusive ones – and intimate that you would be a fool, or a person whose priorities are criminally flawed, not to send your children there (not that you’d need to be told). But this is a liberal publication, and so it must proceed with circumspection, and make some convoluted noises about the socio-economic realities that counsel against judging schools solely on the basis of academic achievement before doing it anyway. Therefore editor Simon Wilson proceeds to write a story designed to make you feel like you’re not crass enough to look at a league table of schools, for you know better and are a better person than that, and then produce a league table of schools, as if such a document could be compiled, purchased and read without actively participating in the system that perpetuates inequity. The master trick employed by Wilson and Catherine McGregor, who assembled the data, is to introduce a ‘relative score’ in order to adjust results by decile group, and give schools that operate in poorer socio-economic areas a fighting chance. So much of a fighting chance, in fact, that the single school that comes up on top of most of Metro’s tables is a decile-1 establishment, McAuley High School, by virtue of how much it outperforms schools of comparative decile. Once you’ve bought this part of the argument, which the author does a consummate job of selling, you can safely proceed to ignore the relative score column and get on with the business of comparing the raw pass marks of the schools, which is the whole purpose of the exercise. After all, why would you care that a school that works with disadvantaged kids outperforms another school that works with disadvantaged kids? Your job is to give your children a better chance, not make them relatively better off than a bunch of children whose chances aren’t very good. However the relative score isn’t just a liberal’s conscience-stroking device (although by God it is that). It serves also to extend the logic of competition to low-decile schools, thereby making it universal. Wilson is masterful here: he introduces with an affectation of ill-concealed contempt the fierce rivalries that consume the most prestigious schools – King’s College versus Auckland Grammar, the richest private school versus the state school with true elite status – as a key to the peculiar psychology of the popular middle-class obsession with school choice (which he has the gall to chide: ‘why do we worry so much? We know most kids go to their local state school and do just fine’), and then extends it to the communities that don’t share this obsession, no doubt in part because they don’t have the luxury of choice. How many working-class families would you say are likely to be able to afford (or be allowed) to send the children out of zone, let alone to a private school? What use would this information be to them? But a subtler yet equally important point is this: that by this stage, even as you read this blog post, you might have unwittingly, reflexively accepted as factual the proposition that McAuley High School is a better school than the other schools in its decile grouping. And if you have, then you have also agreed just as tacitly that academic achievement – being the only meter employed – is the sole determinant of the quality of a school. The unequivocal claims made by the magazine’s cover notwithstanding (THE BEST SCHOOLS… AND THE WORST! ), this is a proposition that the author, determined to have it every which way, both supports and rejects, suggesting at one point that there are in fact as many as five indicators of how good a school is. These are as follows: across the board academic achievement, top academic achievement, values, safety, and breadth and depth of opportunity. However the tables refer only to the measurable achievement criteria, so the remaining criteria are totally irrelevant to the 'unique information' that Metro is selling. ‘Values’ don’t fit in the table. ‘Breadth of opportunity’ doesn’t fit in the table. The above-average results among Māori and Pasifika students reported by some of the schools in the survey don’t fit either, and so the fulfilment of one of the core objectives of our national education framework is liquidated with a condescending nod (‘good on them’). But what is missing even more glaringly are ‘special needs [sic] and/or refugee students or others in “Alternative Education”’. All of these kids are literally a footnote in Metro’s tables, a footnote that simply states that they are not included in the calculations. And, not being included in the calculations, they disappear. In fact Simon Wilson doesn't see fit to use the word ‘inclusion’ in his ten-page story, not even as a vague, generic value to tick off a list of pious concerns. Not once. These children don’t matter. If you’re a parent of one of these children, you don’t matter. If your school does great work with some of these children, it doesn’t matter. Your children are drowning, and what are you going to do about it? I wrote last month that the current wave of attacks against public education in countries such as New Zealand operate by driving a wedge between the aspirations of the middle class and the realities faced by the working class. Well, this is it. The wedge. 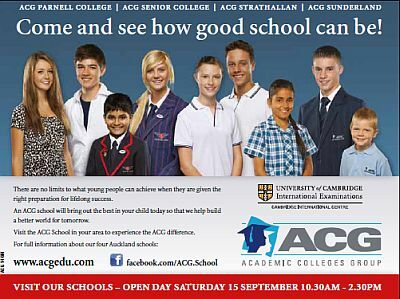 Look at the perfect, smiling, non-drowning children in the ads for private schools that accompany Metro’s league tables, and that I've included in the post. Who wouldn’t want their children to be like them? And so a story that, at the peak of its disingenuousness, set out to critique the proposition that ‘we are failing our kids if we don’t send them to a private school’, turns out to be about the privatisation of the very idea of education. By the end of it, public education has ceased to exist simply in that there is no longer a public. Just endlessly mobile individuals, their able-minded children and their freely-made choices. It’s hard to tell if this idea is a product that is being sold to us, or if instead we are the product that Metro is selling to its eager advertisers. Most likely both. But since politics nowadays is a secondary product of marketing, it is also important to correctly interpret Metro's cover and the story's paid advertisements as vehicles of political content aimed at the liberal consumer/voter for the purposes of promoting wider acceptance of school league tables. 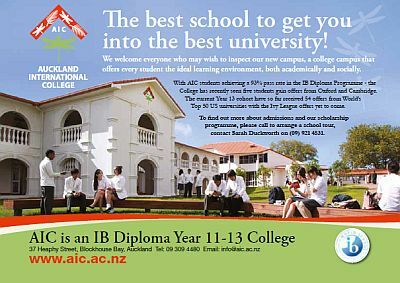 Private schools and corporate commercial media produce these messages in the normal course of business; our liberal politicians may be a little more conflicted, but having espoused every other aspect of free-market ideology will be under considerable pressure to relent, as they have in the UK, the US and Australia. This is a battle that I don’t expect progressives to win. It is all but lost already. But cling to public education as an idea and as a institution we must, and protect what we can. Otherwise we might as well go ahead and close down the schools.